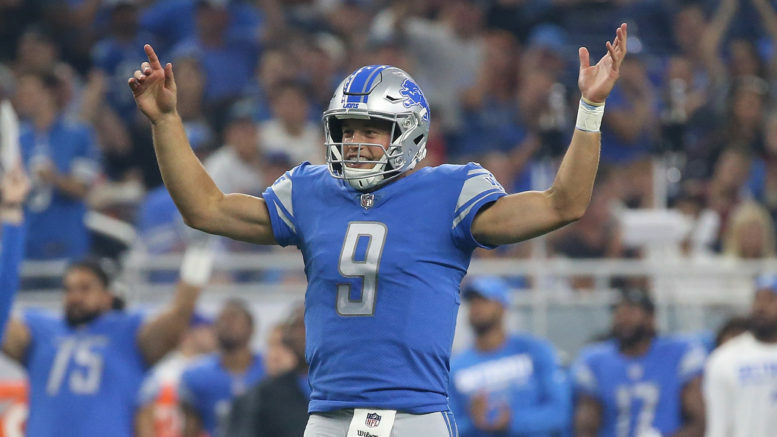 Matthew Stafford and the Lions are looking to win in Green Bay, where the franchise hasn't had much to celebrate. Detroit has one win there since 1991. The Saints are rolling, and the Bucs are reeling. But this feels like one of those games where both teams have kind of hit the extremes of their respective stretches; the Bucs are bad, but are they really 2-5 bad? The Saints are good, but are they really 5-2 good? This is a rivalry game, so it figures to be close either way. Pick: Buccaneers. I’m saying this right off the bat: if you think the Jaguars defense is as good and physical as advertised, the Bengals will play scared just as they did in Pittsburgh a few weeks ago. Both of these teams actually have top-ranked defenses (Cincy is fifth, the Jags are sixth), but Jacksonville’s pass defense is the NFL’s best and Cincy’s offense ranks 31st. It’s amazing the Bengals are even 3-4, while Jacksonville has a chance to hit the halfway point above .500 for the first time in 57 years (okay, actually it was only 2007). Pick: Jaguars. This Falcons team has no guts, plain and simple. That was proven in Super Bowl LI, and again over the past few weeks in a blown 17-point lead to the NFL’s worst offense and a seven-point showing against the Patriots in a game they had circled on their calendar for eight months. On the flip side, the 5-3 Panthers are a home underdog despite the fact that they’ve beaten New England and Detroit on the road. Cam Newton and the offense can be fickle, no doubt, but the defense has Luke Keuchly back, and the Falcons winning two road games in as many weeks seems unlikely. Pick: Panthers. The Texans hung with Seattle until the final gun last week, but for as bad as this Indy team is, you just have to feel that now with DeShaun Watson done for the year, Houston has taken one too many gut punches. Jacoby Brissett can stop looking over his shoulder now that Andrew Luck is done for the year. The Colts are bad, but the injury-riddled Texans aren’t going to scare anyone with Tom Savage at quarterback, so Indy figures to hang close all game. Pick: Colts. This Lions team really suffered a letdown last Sunday night against Pittsburgh. But there is no excuse this week to lose to the Brett Hundley-led Packers, even at Lambeau Field, where they’ve won only once since 1991. Detroit had plenty of opportunities against the Steelers and couldn’t cash in, and desperately needs this one. A Lions win would put both teams at 4-4 after eight games, which seems perfectly fitting. Pick: Lions. Be the first to comment on "They’re Back! NFL Picks, 2017 Edition"